Amber Ruffin appears on Ask Me Another at the Bell House in Brooklyn, New York. 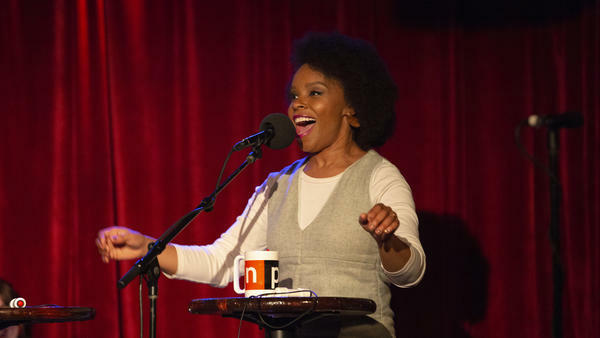 Before Amber Ruffin began writing for Late Night With Seth Meyers, she performed with Boom Chicago in Amsterdam and The Second City. However, a rejection from Saturday Night Live marked a turning point in Ruffin's career. In a conversation at the Bell House in Brooklyn with Ophira Eisenberg, host of NPR's Ask Me Another, Ruffin reflected on her audition. "We auditioned for SNL and there was LaKendra Tookes, she got hired as a writer; Leslie Jones, at first she got hired as a writer; Sasheer Zamata, she got hired as an actor. And Amber Ruffin, who got hired as nothing." Ruffin recalled that two days after the audition, she was nannying back in Los Angeles when she received a phone call from Seth Meyers. "I assumed he was calling to say 'I'm sorry you didn't get SNL.' It never occured to me that he had a late night show and that he would want me to write on it." Meyers initially hired Ruffin as a writer, but as her role on the program expanded, she has become one of the show's breakout performers, featuring in popular segments such as "Jokes Seth Can't Tell," "Amber's Minute of Fury" and '"Amber Says What." "I came up with 'Amber Says What' because of the Olympics. That guy from Tonga had all that oil on him and no clothes and I was like, 'What!?! There are families at home watching this and your thighs, sir, are glistening.' So I just wrote a 'What' about that Olympics, and we ended up doing it again. And then 'Minute of Fury' just came from, you know, racism in America." In addition to Late Night, Ruffin also appears as a narrator on Drunk History. Ruffin said that as an intoxicated narrator, she usually does not have to worry about having one too many of her drink of choice, vodka redbull. "For Drunk History it doesn't matter...they will fix it so you look like you didn't go throw up"
Among Ruffin's recent projects is Bigfoot, The Musical, which began as a part of the "Serial Killers" show at Sacred Fools Theatre Company in Los Angeles, but has evolved to have its own run at the Majestic Repertory Theatre in Las Vegas this past summer. For her Ask Me Another challenge, Ruffin competed against Michelle Wolf in a game about lesser known mythical beasts. While Laurell and Ben get ready for our final round, it's time for us to meet our next special guest. She's a writer on "Late Night With Seth Meyers" and frequently appears on the show. Amber Ruffin, everybody. EISENBERG: Amber, welcome back to ASK ME ANOTHER. EISENBERG: So you narrate "Drunk History." RUFFIN: Yes, dude. It's the best time. EISENBERG: I got to say I wonder - first of all, what is your drink of choice? EISENBERG: Nice. And how do you figure out what your perfect intoxication to performance balance is? RUFFIN: Not for - for "Drunk History" it doesn't matter. RUFFIN: ...You look like you didn't go throw up. EISENBERG: Right. Oh, dear God. So you audition for "Saturday Night Live" in 2014. You do not get it. But instead, you get a call from Seth Meyers. EISENBERG: Just tell me how that kind of happened. RUFFIN: They all got the part. I didn't get the part. There were two days in between my not getting "SNL" and my getting "Late Night" where I was just back in LA, babysitting my perfect baby because I was a nanny. And then I got a call from Seth Meyers. And Seth was like, hey, Amber. And I was like, oh, man, Seth, you didn't have to call. I assumed he was calling to say, I'm sorry you didn't get "SNL." RUFFIN: It never occurred to me that he had a "Late Night" show and that he would want me to write on it. But he did. And now we all have jobs. Yay, four people. EISENBERG: That's great. That's great. EISENBERG: In addition to being a writer, you appear in many segments on the show, Amber's Minute of Fury, Jokes Seth Can't Tell, just to name a couple. EISENBERG: What is the genesis of these segments happening? RUFFIN: Girl, I just came in there angry. RUFFIN: Jokes Seth Can't Tell was Jenny Hagel, who I do jokes Seth Can't Tell with. She and I really write everything I do on the show together. We're little best friends. She came up with Jokes Seth Can't Tell because she was like, we are hemorrhaging these delicious jokes. And they're just going to go into the garbage, and no one's ever going to see them. She thought that was a shame. But then I came up with Amber Says What because of the Olympics. Remember that guy from Tonga had all that oil on him and no clothes? And I was like, what? RUFFIN: This is - there are families at home watching this. And your thighs, sir, are glistening. RUFFIN: OK. So then I just wrote a what about that Olympics. And then we ended up doing it again. And then Minute of Fury just came from, you know, racism in America. EISENBERG: Yeah. What kind of feedback do you get from your fans after they watch a Minute of Fury. RUFFIN: ...Anything like this was happening. You have opened my eyes, ma'am. RUFFIN: It's great. But reading it does make me laugh quite a bit. RUFFIN: I just think that's a silly thing to happen. EISENBERG: That's great. Amber, are you ready for your ASK ME ANOTHER challenge. RUFFIN: Yes, but it's going to be bad because I don't really know anything. EISENBERG: ...Amber Ruffin, you wrote a musical about Bigfoot. RUFFIN: (Singing) Yes, I did. EISENBERG: What inspired your love of Bigfoot? How long has this been going on? RUFFIN: I just like big, hairy things. RUFFIN: No, I just thought that would be a fun, you know, topic for a musical. RUFFIN: And I wrote "Bigfoot" what my friend Kevin Sciretta and David Schmoll. And we just made this big, beautiful musical that was just as silly as humanly possible. And it just really turned out to be something very beautiful. And who knows? Maybe it's going to do something. EISENBERG: I would love that. Are you kidding? EISENBERG: So Bigfoot is one of the legendary probably-fake creatures out there, just like the Loch Ness Monster, Yeti or Chubacabra. They are known as cryptids. So your quiz is about lesser known cryptids of the world. EISENBERG: Good. So for this challenge, we are going to bring back, as your competitor this time, Michelle Wolf, everybody. RUFFIN: Vocally, which one is which? You do not know. EISENBERG: All right. You guys are ready to roll. EISENBERG: All right. Here's your first question. It's multiple choice. Here we go. What is the Jersey Devil? A, a Tasmanian devil wearing a hockey jersey; B, a legendary squid that causes shipwrecks off the coast of Normandy; C, a creature with a goat head and wings from southern New Jersey. EISENBERG: What is Ogopogo? A, a pogo stick that bounces on its own? B, a Lake Monster in British Columbia; C, a Texan snake with a head on both ends of its body, making it a palindromic reptile. That is the same forward and backwards, just like the word Ogopogo. RUFFIN: I think it's B. Say B.
WOLF: I'm going to go B. I'm going to go B.
EISENBERG: It's essentially the Canadian Loch Ness Monster. Three sightings happened just this September. EISENBERG: What is a Globster? A, a sloppy lobster; B, a mobster who reproduces via asexual budding; C, an organic blob that shows up next to a lake or ocean. EISENBERG: ...The bodies of dead animals. RUFFIN: (Singing) I'm just guessing letters that I think are the answer. WOLF: I feel like I pressed my buzzer before you. RUFFIN: (Singing) Michelle is actually thinking. See how far that gets you. WOLF: I would start singing, but it sounds like this - (high-pitched screaming). WOLF: All right. Here's your last one. What is the Snallygaster? A, demon who pops out of nowhere to shame you for being surprised at something obvious, B, a cloud of spores that can take the shape of any person or, C, a dragon like beast that terrifies the people in the Washington, DC, metro area. EISENBERG: I'm sorry. That is incorrect. EISENBERG: That is right, Amber. It's C.
EISENBERG: But you both did great. EISENBERG: I would like to congratulate you. Thank you, Michelle, for coming back to play. Amber regularly appears on "Late Night With Seth Meyers." Give it up for Michelle Wolf and Amber Ruffin. (APPLAUSE) Transcript provided by NPR, Copyright NPR.